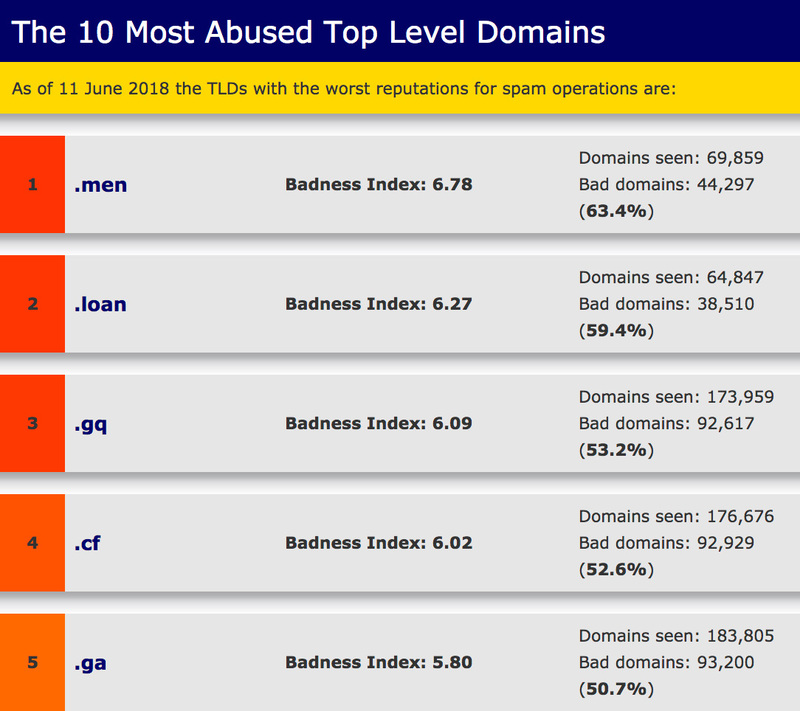 Partial list from Spamhaus' The 10 Most Abused Top Level Domains as of 11 June 2018TLDs such as .men and .loan are listed as some of the most abused top-level domains in the world. Spamhaus which has been tracking spam and related cyber threats since 1998, says some domain name registrars and resellers knowingly sell high volumes of domains to bad actors for profit, and many registries do not do enough to stop or limit this endless supply of domains. To shed light on the situation, Spamhaus is running a dedicated a page on its website showcasing "The World's Most Abused TLDs." — "A TLD may be 'bad' in two ways," reads a paragraph from the page. "On one side, the ratio of bad to good domains may be higher than average, indicating that the registry could do a better job of enforcing policies and shunning abusers. However, some TLDs with a high fraction of bad domains may be quite small, and their total number of bad domains could be relatively limited with respect to other, bigger TLDs. Their total 'badness' to the Internet is limited by their small total size." — "The other side is that some large TLDs may have a large number of bad domains as a result of the sheer size of their domain corpus. Even if their corrective measures are effective, they still constitute a problem on the global scale, and they could assign further resources to improve their anti-abuse processes and bring down the overall number of bad domains." — Security expert Biran Krebs reporting on the Spamhaus' list says: "[T]he Internet Corporation for Assigned Names and Numbers (ICANN) - enabled the new TLDs in response to requests from advertisers and domain speculators - even though security experts warned that an onslaught of new, far cheaper TLDs would be a boon mainly to spammers and scammers. And what a boon it has been. The newer TLDs are popular among spammers and scammers alike because domains in many of these TLDs can be had for pennies apiece. But not all of the TLDs on Spamhaus' list are prized for being cheaper than generic TLDs..."
Local Time: Tuesday, April 23, 2019 05:46 AM PDT – Page Load: 0.3453 Sec.